2018 Royal Enfield Thunderbird 350X Vs 500X: What’s The Difference? Check out the comparison story of Royal Enfield Thunderbird 350X Vs 500X to know the difference between both the variants. Royal Enfield Thunderbird X series was launched last year. It gets some cosmetic changes over the regular Thunderbird to showoff a modern-urban appeal to the younger generation. Thunderbird is the only cruiser in Royal Enfield’s lineup. The first one came up in the early 2000s and since then has been one of the best selling products in its stable. The basic difference between Thunderbird 350X and 500X is Pricing and engine. Other than that, there are some minor differences between both the cruisers. So check out the comparison story on Royal Enfield Thunderbird 350X Vs 500X for a better idea. The 2018 Thunderbird 350X costs INR 1.62 lakh (ex-showroom, Delhi). The 2018 Thunderbird 500X retails at INR 2.13lakh (ex-showroom, Delhi). The engine line-up of the 2018 Thunderbird X series is the same as before. The 2018 350X gets a single cylinder 346 cc engine. It produces 19.8 BHP along with 28 NM of peak torque. The 2018 500X gets a single cylinder 499 cc engine. This motor produces 27.2 BHP along with 41.3 NM. A 5-speed manual transmission is offered. Both the bikes get dual disk-brakes. However, both are devoid of ABS. The 346 cc engine in the Thunderbird 350X promises a mileage of 30 to 35 km/l. The 499 cc engine in the 500X promises a mileage of 25 to 28 km/l. Both the bikes offer a similar level of specifications. 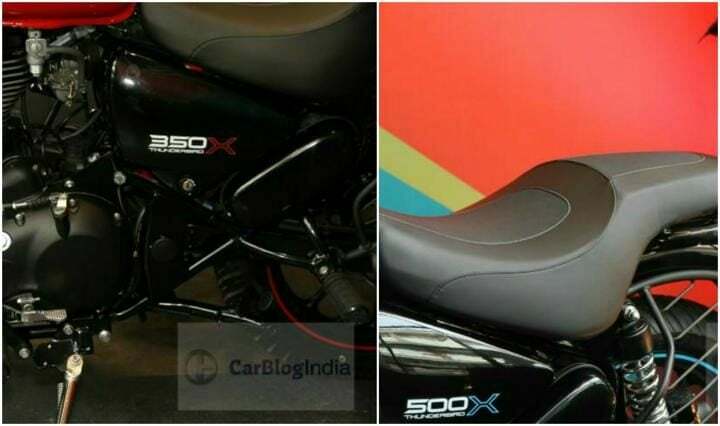 The styling of both the 350X and the 500X are identical to each other. The first difference is the 350X and the 500X nametag printed on the side of each cruiser. The second difference is that Thunderbird 500X gets a small windscreen on the front, while 350X gets it as an additional accessory. The Thunderbird X series comes with new-wider handlebars. Also on offer are new alloy wheels with tubeless tyres and fuel tank coloured rim highlights. Both the bikes get black colour on the engine and other components. This gives the cruiser a sporty appeal. The front and rear wheels of both the bikes come with disk brakes. Other features include LED daytime running lights along with LEd tail-lamps. This is the next big difference between the motorcycles. Thunderbird 350X is offered in two colour options – Red and White. On the other hand, Thunderbird 500X is offered in Blue and Orange. So, what’s your pick from these two variants? Would you go for the low powered and affordable one or the higher powered variant priced above Rs 2 Lakhs?